On a petrol injected engine with a suspect fuel related problem, it is important to correctly determine if the fuel supply and fuel pressure is adequate for correct engine operation. “Guessing is not an option”. With so many areas of the fuel system susceptible to faults that can cause reduction in fuel flow and pressure, the technician must not only find and repair/replace the affected area or component but also the cause of the fault as this generally eliminates an expensive break down tow bill and upset customers. When it comes to the fuel pressure regulator, it is important to identify its location as this will determine if manifold vacuum plays a part in fuel pressure control. 1. An EFI system with an FPR mounted on the fuel rail utilises manifold vacuum to minimise operating fuel pressure variations. External visible fuel seepage at the diaphragm crimp area. Perforated diaphragm casing hard starting and excessively rich mixture. Damaged valve seat causing leak back of residual fuel pressure when engine switched off. This causes hard starting due to fuel draining back to the tank. Strainer on the intake side of FPR may become restricted by contaminated fuel sediments or fuel rail Internal flaking. This common condition results in an ever-increasing fuel pressure as the vehicle is driven, causing an over rich mixture and performance issues. Fuel pressure generally returns to a normal state after the engine has switched off and the sediments fall off the strainer. Internal valve jammed on seat, creating excess fuel pressure and performance issues. This can easily be identified as maximum fuel pressure with no fuel return from FPR to fuel tank. The use of a PlusQuip EQP-100 Fuel pressure and flow test kit or PlusQuip EQP-108 fuel pressure test kit is a must have diagnostic tool when diagnosing fuel system faults. 2. An EFI configuration with a common returnless fuel system utilising an FPR mounted on the fuel pump assembly with no vacuum assistance. This system pressure is maintained at a constant level with reference to the surrounding pressure. (no vacuum effect on the FPR). This needs to be considered and must be taken into account when the injection duration is calculated. Typical FPR faults found with this system – Incorrectly fitted FPR resulting in internal fuel pressure loss and creating a low fuel pressure with prolonged cranking engine starts is the most common fault. This may be quickly diagnosed by the instant loss of residual pressure as soon as the fuel pump stops. Note: Even though there may be other FPR faults found on many of the assemblies, these may not be serviced separately. 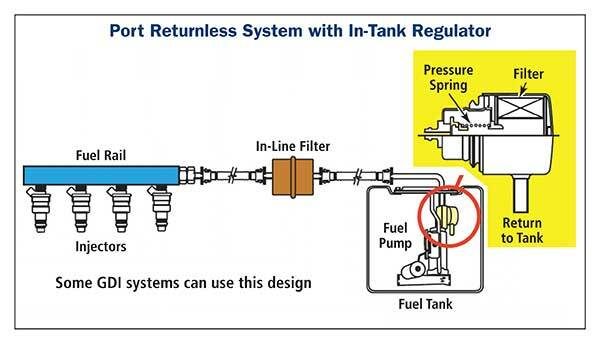 This FPR is regularly replaced when the allocated service is due or generally when the fuel pressure is not within specifications due to contamination of the fuel. 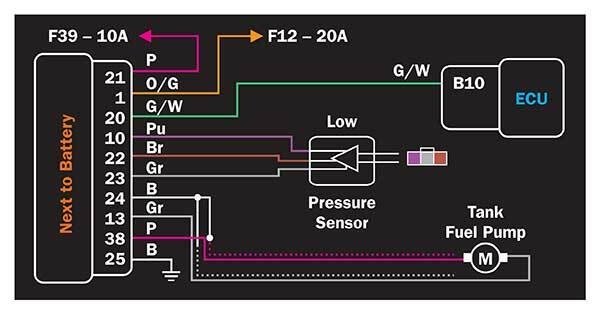 The operating pressure on this system is much higher than a conventional EFI configuration. 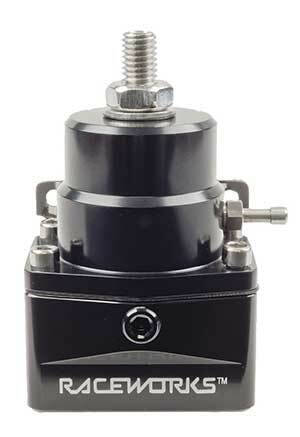 A high-pressure mechanical fuel pump that is generally driven by the cam shaft supplies the fuel rail with a varying fuel pressure on some systems up to 350 Bar. 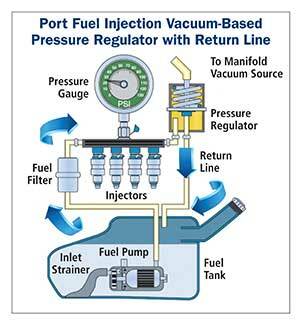 The pressure regulation occurs in the high-pressure fuel pump but an in-tank fuel supply module (pump assembly) with integrated fuel level sensor and fuel filter supplies the high-pressure pump with the required amount of fuel at a varying pressure of up to 6 Bar that is PWM controlled by the ECM. 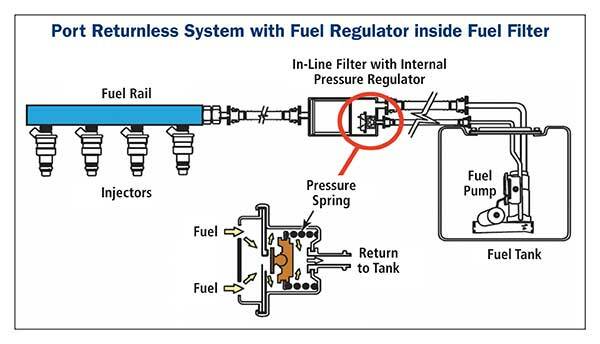 Note: The ECM monitors both low fuel pressure supply from the tank directed to the high-pressure pump, as well as the high pressure in the fuel rail. 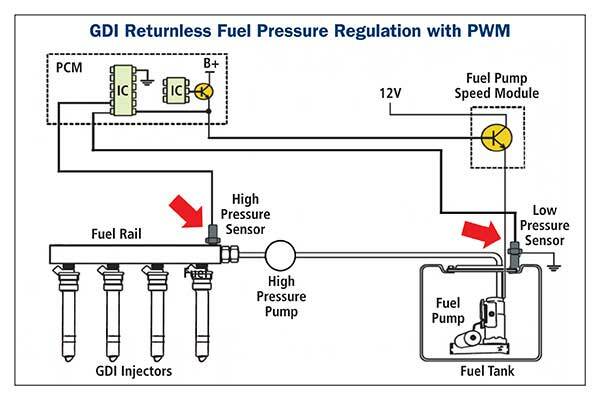 A low fuel pressure sensor as well as a high fuel pressure sensor are utilised to allow the ECM to accurately adjust the rail pressure. A typical low-pressure control circuit on a VE Commodore SIDI utilises a controller located next to the battery. A typical high-pressure control circuit on a VE Commodore SIDI utilises a high-pressure pump fuel control solenoid and a rail mounted sensor. Adjustable fuel pressure regulators are generally utilised for applications where the fuel pressure may be required to be increased to suit any engine performance modifications that have been carried out. It is important to note that increasing the fuel pressure but still retaining the same fuel pump, will result in a reduced system fuel flow. For correct system operation It is important to match the fuel pump with the operating pressure that is required to maintain the correct fuel flow and reduce the risk of severe engine damage. Note: The use of Ethanol fuel is another factor to consider when fitting an adjustable replacement regulator or fuel pump. Ethanol has an effect on some internal Component materials. The Premier Auto Trade Fuel range includes almost 150 Fuel Pressure Regulators (FPR’s) from the world’s leading manufacturers, covering over 5.5 million vehicle applications in Australia and NZ.